The design and assembly of the Venera-D probe are part of the Federal Space Program for 2006–2015. Source: NASA. Russia is returning to large-scale research in outer space, with a focus on solar system exploration. According to Roscosmos (the Russian Federal Space Agency) head Vladimir Popovkin, Russia is planning to implement its Venera-D program in 2020–2025. “The relevant research and development is underway, with the launch scheduled for 2020–2025,” Popovkin said at the Third Moscow Solar System Symposium in early October. The project involves an orbiter, a sub-satellite, one or two balloon probes and a durable descent module conducting comprehensive remote and in-situ studies of Venus. The design and assembly of the Venera-D probe are part of the Federal Space Program for 2006–2015. Under the new program – a potential contributor to Russia’s long-term space science development strategy – an Automatic Interplanetary Station (AIS) will be sent to the probe during the middle of the next decade. Given the high complexity of the project and the need to restore the relevant industrial technologies for designing the landing unit, the Venera-D project can be expected to kick off no sooner than 2024. The eventual objective of the project is to obtain information on the dynamics and composition of the Venus’ atmosphere, as well as to study the geological properties of the planet’s surface. A list of the relevant research equipment has been developed and an international group of scientists has formed on the basis of the communities surrounding the active European probe, Venus Express, and the currently designed European Venus Explorer (EVE). If everything goes as planned, the researchers believe they may be able to answer the question of why water, a potential source of life forms on the planet, disappeared from Venus at some time in the past. In order to succeed at this task, the AIS will be equipped with a set of complex orbit and landing equipment. In accordance with the project requirements, an orbiter, a descent module and a small satellite will all embark on a journey to Earth’s neighboring planet. The lander will need to pass through Venus’ dense atmosphere in one hour and survive on its 887-degrees-Fahrenheit surface for at least two more. As for the orbiter, it must be able to stay in orbit for three years or more, jointly engaged in observation activities with the small satellite. The orbiter will be responsible for releasing the probes; one of them will stay at 34-37 miles above the planet surface, while the other will penetrate below cloud level to 28-31 miles above the surface. The balloon probes are expected to last for more than eight days, while the descended module should be able to work on the surface for at least several days. If the Venera-D mission is provided with a Zenit medium expendable carrier rocket, an Italian radar may be added to the planned set of equipment. If, however, a Proton-M heavy launch vehicle is used instead, the expedition will be additionally furnished with a wind-propelled float probe that will operate for a month at 28-31 miles above the surface of Venus. 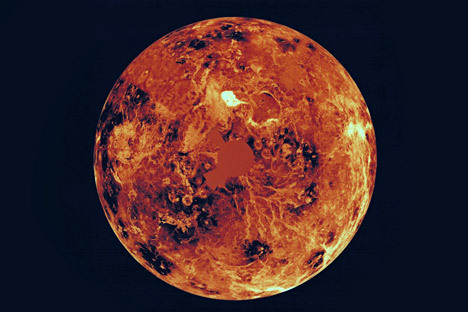 Venera-D is the first Russian probe to be launched to Venus since the collapse of the Soviet Union, whose success exploring the morning star with its AIS’s was so prominent that Venus was dubbed the “Russian Planet” in the West. The Russian Academy of Sciences has also laid out plans for other, more “far-reaching” missions – to Mercury, in particular. According to these plans, the currently developed Mercury-P spacecraft may set off for the planet in the 2030s. If the Mercury exploration program comes to life, the Russian probe will become the first of its kind to land on the surface of the planet. As of now, Russian scientists have conducted a preliminary study of the project, designed a concept of the landing module and compiled the list of scientific equipment. Long before the Russian spacecraft lands on Mercury, Europe’s BepiColombo is set to deliver Russian equipment to the planet in late 2014. From 1961 to 1983, the Soviet Union launched a total of 16 Automatic Interplanetary Stations (AIS’s). The Venera-1 station, launched on February 4, 1961, was the first spacecraft ever to travel to Venus. It was also the first planetary probe in the history of humankind. Unfortunately, after successfully taking off from Earth, the station failed to complete its mission and drifted off into outer space. A more successful attempt took place on February 12, 1961, even though contact with the probe was lost seven days later (presumably owing to the overheating of a solar-direction sensor). The station passed by the planet at a distance quite close by space standards – 62,137 miles. It was the first fly-by of Venus performed by a manmade spacecraft. The Venera-3 station, launched in February 1966, managed to reach the planet, thus becoming the first artificial object to land on its surface. In October 1967, Venera-4 delivered a spherical landing capsule, which descended on Venus’ nightside using a parachute system. The data obtained suggested that, as far away from the surface as 15 miles, atmospheric temperature was 520 degrees. The Venusian atmosphere was found to be 90 percent composed of carbon dioxide; the probe also discovered the planet’s hydrogenous corona. The data processed by Venera-4 indicated that the surface pressure amounted to approximately 100 atmospheres. This information was important for designing the next Venera-series probes. Venera-8 was launched on March 27, 1972 and achieved the first ever soft landing on the dayside of Venus 117 days later, on July 22, 1972. Venera-9 and Venera-10 represented a new generation of heavy AIS’s. In October 1975, the landing capsules carried over by these orbiters descended on the dayside of the planet, approximately 1,240 miles apart. These landers were the first to return images from the surface of another planet. They also measured the soil density and composition of the natural radioactive elements. Transmission from the capsules lasted for 53 minutes. The stations themselves continued their flight and became the Venus’ first artificial satellites. The Venera-13 and Venera-14 descent crafts performed a soft landing on Venus in March 1982. The landers took the first color photographs of the planet’s surface and directly analyzed the compressibility of its soil. Venera-15 and Venera-16 reached the planet in October 1983. They transmitted radar images of the Venusian surface for several months. The Soviet Venera missions were succeeded by the Vega program, which focused on studying the Venusian atmosphere with probes, as well as exploring Halley’s Comet. Vega-1 and Vega-2 AIS’s were launched in June 1985 to achieve this goal.